All Hatch reels are designed with the same buttery smooth stacked disc drag system. This system employs multiple discs of stainless steel and Rulon which dramatically increases the surface area. In turn this makes for virtually no start up inertia and massive stopping power. By virtue of the fact that it's sealed, all Hatch fly reels require no lubrication or maintenance. 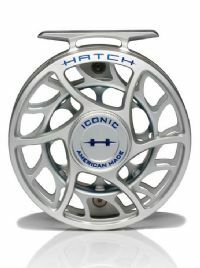 The latest line of Hatch reels is the Finatic. The newest Hatch reel comes in 8 different sizes, from the tiny 1 Plus for 0-3 weight lines to the monstrous 12 Plus - designed to handle all of your bluewater needs. No matter which Hatch fly reel you choose, it will be a winner.